For some reasons Microsoft has removed such a useful tool from RSAT (Remove Server Administration Tools) for Windows 8 and 8.1 and it’s not on Windows 2012 and 2012 R2 server either. Looking around on the internet I haven’t found many people posting a concrete solution that allowed us to use the Microsoft Terminal Services Manager for Windows 8+. I prefer to avoid installing a 3rd party tool when Microsoft had a good application that could achieve that. Some people on forums said “why don’t you just use task manager?”. Well these people clearly never worked in a large environment 🙂 . The thing I liked the most about the Terminal Services Manager is the way I could create groups and look at all of the sessions from different servers in the same screen (still thinking about the guy who proposed to use task manager..). Yup 🙂 There’s one and it worked on my Windows 8.1 system. Other people have reported that this solution works on Servers too but to be honest, I would not apply such a solution to a server. You can, but I won’t 🙂 . I’m not sure yet whether the files required are the same on both x64 and x86 OS, I’ve done this by getting the files from a 2008 R2 (x64) machine and applied them on my Windows 8.1 x64 laptop. 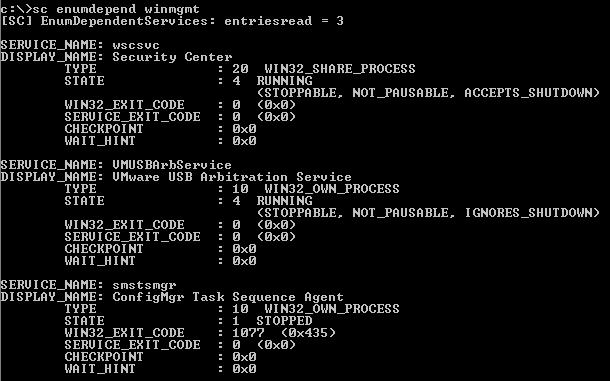 Note: When I did it, I already had umcRes.dll in System32 and I decided not to overwrite it. Copy them all in C:\Windows\System32 on the machine running Windows 8 (or 8.1, Server 2012/2012 R2). "Description"="Manage Remote Desktop Services sessions"
"Type"="Microsoft.TerminalServices.Monitor.SnapIn.TSManagerSnapIn, tsadmin, Version=6.1.0.0, Culture=neutral, PublicKeyToken=31bf3856ad364e35"
Double click on the reg file you just created on the target machine in order to add these keys to the registry. In case you do not have access to an old 2008 box, no worries, below is the zip file with those files in it (from a 2008 R2 – x64 machine). I’ve also included add_TSadmin.reg in it which takes care of step 3 for you. I initially wrote this post based on a simple command I used to use. That turned out to be partially wrong as sometimes it wasn’t finding the “Deleted Items” folder. After asking on technet, I told it was best to use the -FolderScope option in the command I was running. Guess what? In my environment also that turned out not to be 100% accurate. I was still left with loads of empty results. So I decided to merge the two in a script. Where alias is the alias of the mailbox you’re searching against. -FolderScope is great as it shrinks the amount of time needed to get such results as it doesn’t go through each folder. The problem was that sometimes, for a few mailboxes, I was getting a huge list of folders in the mailbox (note that it wasn’t a full list, I tried running Get-MailboxFolderStatistics with no filters and I was able to see more folders – for some reason they had the DeletedItems scope). Sometimes instead it seemed like the mailbox had no DeletedItems scope, which obviously didn’t return any size. I needed a script that captured a few more info, but if you’re looking to get a better report that will also show you the items that have been skipped, then keep reading this. You will see the full script later on in this page, however I first want to show you the logic process I followed. First of all, $identity is the MailboxGUID I gathered earlier on in the script and the first thing I run is a Get-MailboxFolderStatistics against that identity with the -FolderScope DeletedItems. This is generally pretty quick to run. If the mailbox is ok, the script is done. But if for any reason the variable $FolderSize is empty or it’s an array (which means there’s more than one result), then the script will try to run the same command, this time we’ll add the where filter and look what I did, I searched the mailboxes where I didn’t get a result and found a few translation based on the folder list. Obviously that is not all of them, so if you have more in the environment, just add them in! If also this time $FolderSize is empty or an array, then just try to run the command again, this time excluding the -FolderScope option. This one will be the slowest command as it’ll search through the folders. This made the script much quicker, I went from a report that lasted 10.5 hours to one that lasted almost 4 (large environment). No worries, if your environment is big enough you might end up having a few mailboxes where the script couldn’t get a size for them 🙂 . For example, let’s say that a user created a Deleted Items folder and for some reason it’s also set as a DeletedItems scope. That means the first command will catch both the original one and the new one. The second command will do the same and the third one as well. But from what I’ve seen, it’s a very special case. Instead you might have a few not being recognised. For instance I’ve seen a couple of users in Moscow showing “???? ?” as folder name. I just left them and didn’t mind skipping just a few. Write-Host "Gathering a list of Mailboxes (including Display Name, Total Item Size, Database and MailboxGUID).."
$yyyyMMdd = Get-Date -format "yyyyMMdd"
# due the commas in the FolderSize result. Add-Content -Path $txtOutput -Value "DisplayName|TotalItemSize|Database|DeletedItemsSize|UserAccountControl|OrganizationalUnit|MailboxGUID"
#Get UserAccountControl to report if the account is disabled. #or it's empty, then try to get the size searching through all folders (again, based on known languages). #This should speed up the process a lot if the folder is found. Add-Content -Path $txtOutput -Value "$($output)"
Performing a Lync 2013 silent install isn’t as easy as it was with Lync 2010, especially if the application you’re trying to install was downloaded from the Volume License website. I’m not sure if the issue I had trying to perform a Lync 2013 silent install applies to all version of Lync 2013. The problem I had was that after I created a customised MSP file (keep reading to see how to do that) and started the installation silently, Lync was not there! I could see it in Add/Remove Programs, but I couldn’t see it anywhere else. Not even when I searched in Start: this problem occurred on both Windows 7 and 8.1. Note that I’ve only tried with the 32bit version (also SP1) as that’s the one I need to deploy (also to machines running Windows x64). Basically this file contains updated Office Customization Tool (OPAX/OPAL) files for Microsoft Office 2013. Once you have downloaded the file, run it (it’s a self extractor .exe file) and choose the location where to extract the files. Navigate to the location where you extracted those files and copy the admin folder in the root of the Lync 2013 installation folder and overwrite all existing files and folders. Once you’ve done that, you’re good to re-create the MSP file for a customised Lync 2013 silent install. If you already have the old MSP file you created earlier with the original Lync 2013 installation, you must import it and save it back again. If you’re here just to see how to create a Lync 2013 silent install MSP file, this is the moment 🙂 . 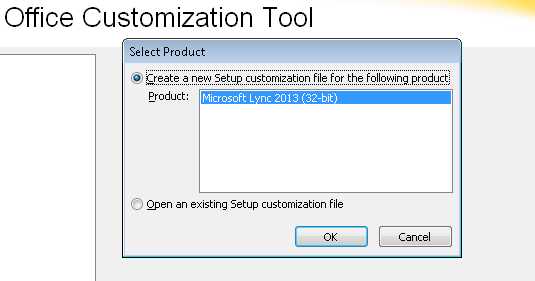 Let’s suppose the content of the Lync 2013 installation is in C:\temp\Lync 2013\x86. This will open up the tool that will allow us to customise the installation. You’ll be prompt to select the version of the application you want to customise and then you’ll be good to start using the Microsoft Office Customization Tool. What I generally modify is the Organization name under Install location and organization name. This is the most important part which will allow Lync to be installed silently. Firstly choose whether you’re going to use a KMS server or just type the product key in. Secondly, you want to accept the terms and conditions and finally select None as Display Level (or just make sure the Suppress modal is selected). In Exchange 2010 SP1 it is pretty simple to get the Database where a user belongs to (or a group of users given a list). 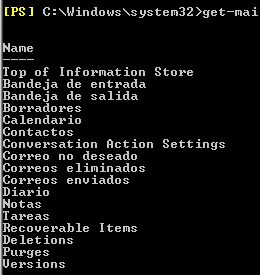 We can achieve this with PowerShell quite quickly with the following command. Where “ALIAS” is the alias of the user you’re searching for. The command will return the Alias and the Database name. If you’ve got a list of users you want to run through (you can import a list in an external text file, in this case just for the sake of showing you how to run through each object of a list, I’m using a variable where each alias is separated by a comma) just use the below. The above will return you the Alias and the Database of alias1, 2 and 3. Note that in this specific case I used .split(“,”). I basically told it to split the list at every comma. The % sign instead is the abbreviation of ForEach-Object. $_ is the current alias being elaborated.